Home » QIFF 2016 » QIFF 2016 – Celebrity Chefs! 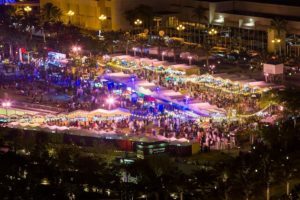 QIFF 2016 – Celebrity Chefs! Celebrity chefs will be creating culinary masterpieces at the Qatar Airways Cooking Theatre, part of the upcoming Qatar International Food Festival (QIFF). Qatar Airways is the co-organiser of the festival with Qatar Tourism Authority. The seventh edition of #QIFF2016 will take place at the Museum of Islamic Art (MIA) Park with new attractions and events at satellite venues in The Pearl Qatar and Katara Cultural Village, from 22–28 March 2016. 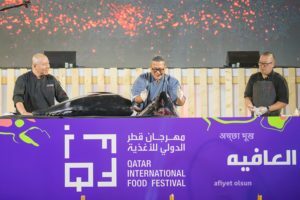 QIFF has grown in recent years to become one of the region’s most prestigious culinary events – demonstrating the power that food has to draw people together. More than 14 highly-acclaimed international and national chefs have been announced by Qatar Airways as presenters at this year’s live Cooking Theatre, offering guests a world of wonderful flavours. The global lifestyle personality will open the Qatar Airways Cooking Theatre at 5 pm on Tuesday 22 March, cooking four nutritious recipes live on the festival’s main stage at MIA Park. America’s most famous homemaker will cook a healthy menu featuring fresh salads and side dishes and her take on an energising booster juice. A QIFF regular (and our personal favourite). He is also Qatar Airways’ ambassador and a multiple Michelin star chef. His Doha restaurant, Saffron Lounge, is located at Katara. Another QIFF regular (his famed Beet Risotto is incredible) and partner of Qatar Duty Free’s Soprafino Restaurant at Hamad International Airport (HIA). Four fabulous chefs from the popular Arabic food channel Fatafeat will return to Qatar Airways’ Cooking Theatre to entertain visitors and showcase some of the world’s best Arabic cuisine. On March 26th Fatafeat Kitchen’s event will host several popular faces of the channel who will be present Arabic and regional cuisine to all food lovers through live cooking demos, Q&A and meet and greet. They will be hosted by Darine El Khatib. Chef Daad Abu Jaber is back this year with a passion for cooking and will share her own recipes developed through a family tradition of cooking. Salma Suleiman will present her love of blending Tunisian and Egyptian cuisines with international recipes to create popular signature recipes. Wafaa Al Kandari will teach visitors the secret of Khaleeji food. Mohammad Orfali, a Syrian chef will complete the line-up focusing on Aleppo and modern Arabic cuisine, demonstrating his 18 years of professional culinary experience. Hamad International Airport, partner of FC Bayern Munich, has secured the football club’s head chef Alfons Schuhbeck to participate in the Qatar Airways Cooking Theatre, giving fans the opportunity to explore the favourite dishes enjoyed by the popular European team’s players. The family-friendly food festival will take place at the Museum of Islamic Art Park, where signature activities such as Qatar Airways’ Cooking Theatre and Dinner in the Sky will complement a range of new eateries, experiences and entertainment planned for 2016.